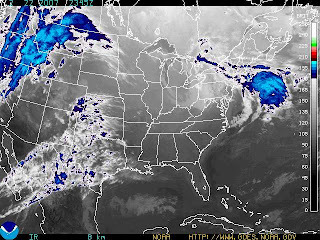 Check out the Satellite Map from the Nat'l Weather Service. It shows a developing system located in Texas that will come together and head this way. Along with a cold front and strong winds, it should produce a bumpy Saturday night for us here in Middle Tennessee. Our highs ranged mostly from the 58 to 61 degree mark up on the Plateau. We should see slightly cooler temperatures for tomorrow FOLLOWED by a big warm-up on Saturday. Even though we're looking at forecasted highs in the middle 60's for Saturday...I believe we could reach 70 in lots of locations with these STRONG southerly winds. On the TV side, we'll wrap up Severe Weather Awareness Week with a review session of all the different items we discussed on TV....they included lightning, flooding, tornado watches/warnings and other severe weather items. Going back to the forecast, we should be warm again Sunday after the cold front passes...it looks like we'll be above our average of 51 for the high and 29 for the low!